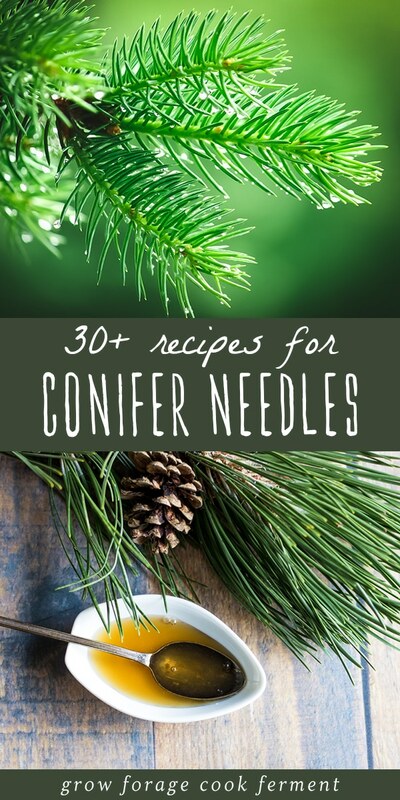 30+ Conifer Needle Recipes: Drinks, Desserts, Syrups, Balms & More! Home / Cook / Foraged Food Recipes / 30+ Conifer Needle Recipes: Drinks, Desserts, Syrups, Balms & More! Evergreen conifers are amazing trees in many ways, but did you know that they are edible? Indeed they are, and they make very tasty cookies, drinks, syrups, balms, and more! Guest writer Lucia Hadella is going to tell us all about the delicious recipes that you can make with foraged conifer needles. These conifer needle recipes are all you need! Spring is on the way, but for most of us it still feels like winter. Many flowers are waiting for warmer days, the birds are holding onto their extra fluff, and the trees are bare. Well, not all trees. This waiting period before spring truly arrives is an excellent time to take advantage of trees that stay green year-round. Enter: The evergreens. They are vitamin-rich, flavorful, and easy to forage! I’m excited to share this post and hope it will help you discover your favorite ways to eat and use evergreen needles. “Evergreen” is a term often used to describe coniferous, or cone-bearing trees. Examples of conifers include pines, firs, spruces, the Douglas-fir (which is actually a false-hemlock), the coastal redwood, junipers, cedars, and false-cedars. There are a number of edible and medicinal uses for conifer needles. For example, most evergreen needles are high in vitamin C and act as an expectorant, making them ideal for herbal remedies, such as this pine needle cough syrup. While many conifers are edible, be aware of those that are not, and learn to identify them confidently. For example, the yew tree (Taxus brevifolia) is toxic and should be avoided. I have briefly confused its dark green needles with those of some fir and hemlock trees, so be extra cautious. In addition, the needles of the ponderosa pine (Pinus ponderosa) are considered unsafe for pregnant women. And as with anything you forage, try to ensure the tree hasn’t been treated with harmful chemicals. For example, some Christmas tree farms use pesticides, herbicides, and even paint to coat tree needles. Most conifer needles, though, are safe, and they’ll add a citrusy, sometimes spicy flavor to cocktails, baked goods, savory dishes, and more. 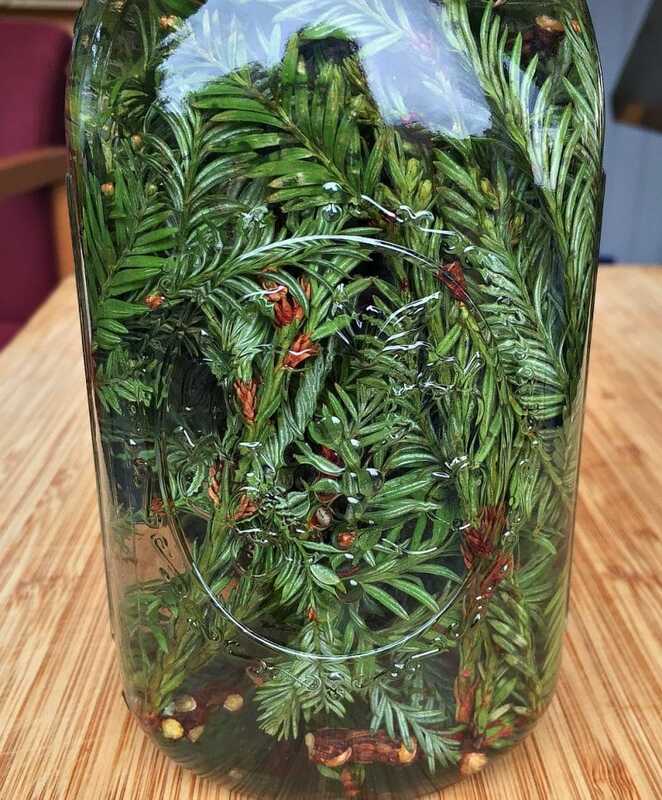 To help you navigate the fragrant world of conifer cooking and simple DIY body care products, I have compiled this post of various recipes where conifer needles are the stars. Read it before your next hike or walk in the park, and you’ll be ready to pinch away those yummy-smelling needles with purpose! Whether you are in the mood for tea time or happy hour, there are many ways to sip on your choice of peppery, citrusy conifer needles. 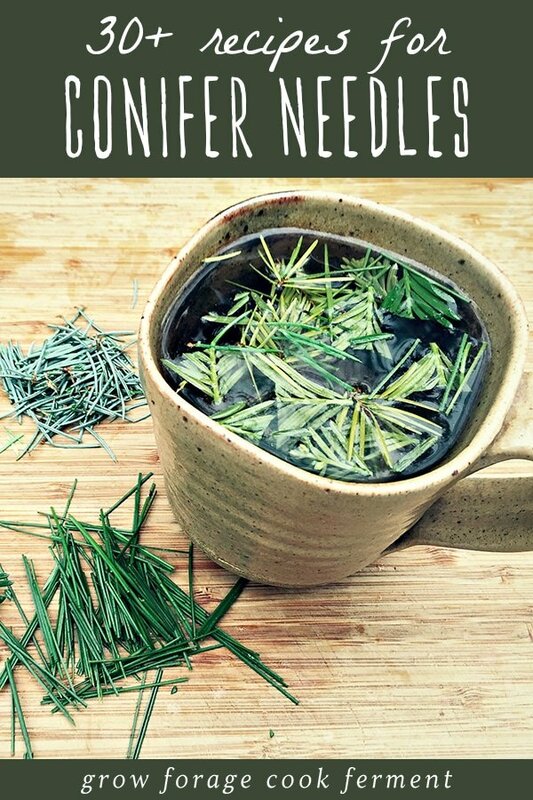 Familiarize yourself with this simple conifer needle tea recipe, and you could be warming your soul with a steamy cup of forest-fresh goodness whenever you please. For those times when you want a hot beverage that is a little more decadent, consider this frothy Douglas-fir-infused eggnog. And remember – it doesn’t have to be the middle of December for you to enjoy a festive mug of nog. If the weather outside is frightful (and it probably will be until, umm, May), eggnog indulgence is more than justified! Shake up your liquor shelf selection with a tasty conifer-infused vodka and an infused winter gin. This Douglas-fir liqueur also sounds wonderful! Leave your dinner guests feeling cozy (and maybe a little rosy!) with a crisp spruce homebrew beer. If you’re looking for a fizzy, fermented refresher that is also downright pretty, prepare a batch of this pine needle and raspberry soda, fermented with wild yeast! To keep the cozy theme going, let’s talk cookies! If you love the aroma of cookies baking in the oven, imagine how incredible your home will smell after you have whipped one of these recipes, featuring aromatic evergreen needles. These redwood needle shortbread cookies are a must-try if you like your desserts with a citrusy kick. And while you’re in the mood for shortbread, why not also experiment with this Douglas-fir shortbread cookie recipe? You’ll soon find yourself sitting down to a plate of buttery cookies laced with the subtle tingle of spice. 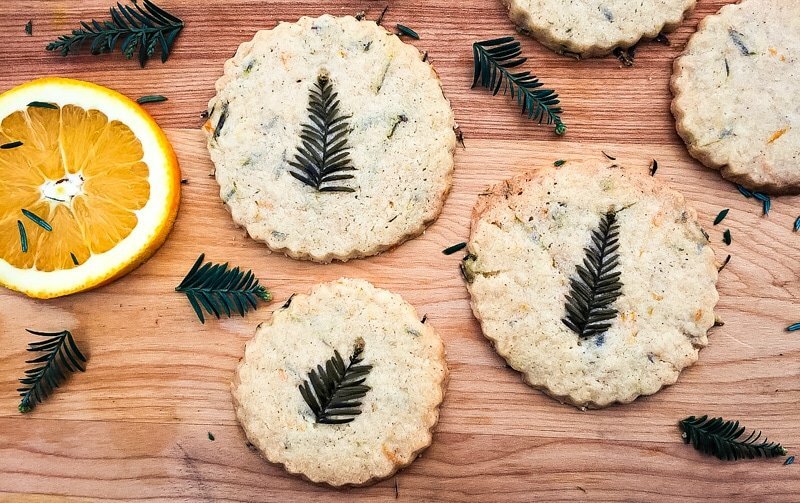 These woodland evergreen shortbread biscuits also sound wonderful! You can’t really go wrong with a name like that. If you’re looking for a cookie you can cut into shapes and enjoy plain or drizzled with icing, try these pine needle sugar cookies. 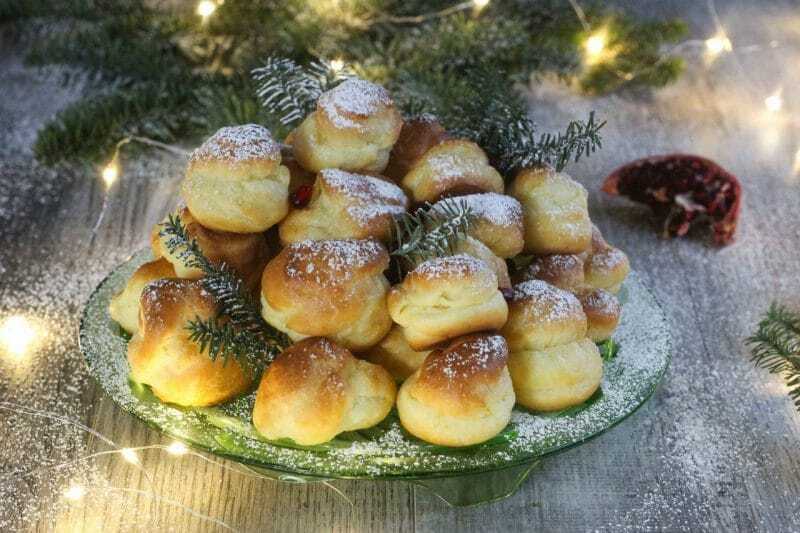 They’re perfect for the winter holidays, of course, but repurpose the recipe for an early spring celebration, and I doubt anyone in your house will complain! This last crunchy treat is a little different. It’s an Old World-inspired grand fir dark nougat that will allow you to skip the eggs and flour and instead compliment your conifer needles with plenty of honey and hazelnuts. Slip cubes of this nougat into a gift basket or chew it with your morning coffee. Yum! The range of citrusy, spicy flavors of conifer needles make them ideal for flavoring your spongy bakes and your creamy concoctions. If you’re hosting friends for dinner, why not wow them with this beautiful Douglas-fir poached pears and frangipane tart? Sitting in a golden crust and topped heavily with pears, this tart will shine in a comfy little cabin or on an elegant dinner table. Or, perhaps you want to skip the pastry and go straight to the cream. These grand fir pots de crème may be some of the cutest conifer desserts I’ve seen, mostly because they are baked and served in little mason jars. Include them in your picnic basket, or serve a whole tray to your party guests. As spring approaches, conifers will begin to produce soft, bright green needles at the tips of their branches. This is the tree’s new growth for the year, and it should be harvested sparingly, focusing on mature trees and taking from more than one tree if possible, to disperse the impact. Here’s spruce ice cream recipe that takes a slightly different approach, in case you like having choices! If you’re in the mood for something lighter, make a refreshing Douglas-fir tip sorbet. With so many sweet ways to prepare conifer needles, you could just skip the savory portion of the menu all together, right? No way! I have been perusing this sampling of savory dips, dressings, and main dishes, and it’s as though a whole new culinary world is opening up before me. This vegan spruce tip pesto sounds like the most creative thing to spread onto your favorite bread, and if you have some spruce tips left over, just pickle them! A smart way to incorporate conifer needles into various meals with only one recipe is this pine needle salad dressing, which will compliment a bowl of fresh garden greens, but I would also love to try it as a marinade or drizzled over braised veggies. For an entrée or hearty side, indulge in some sautéed mushrooms with spruce tips and chives, or a tantalizing pilaf with lemony spruce tips and pine nuts. Oh, and please invite me to your house for dinner. I love the idea of including conifer needles in a seasoning or sweetener, because it is a simple way to quickly add distinctive flavors to any recipe that just needs a little something special. Learn how to easily add conifer needles to your salt, sugar, and syrup for a great pantry addition or gift idea! For something a bit more complex, consider experimenting with an evergreen tonic syrup that combines conifer needles with fruits, herbs, and spices of your choosing. This can be used as an herbal remedy, much like the pine needle cough syrup I mentioned earlier. 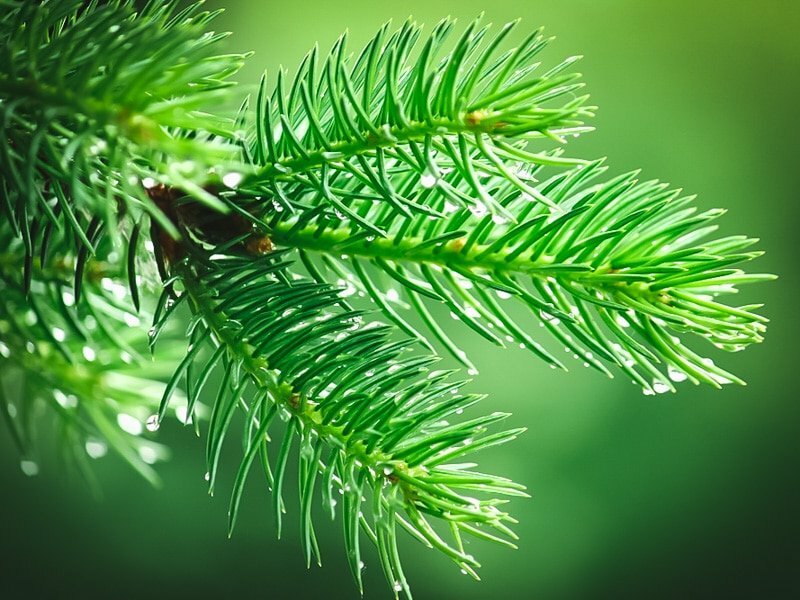 Even if you’ve never eaten conifer needles, you have probably experienced their benefits through fragrant body care products. 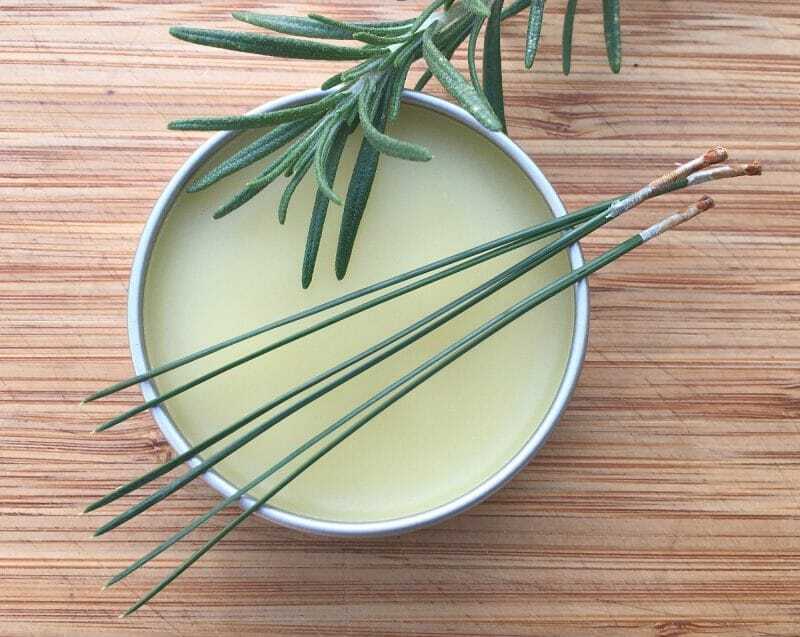 Surprise a (bearded) friend or loved one by making this citrusy rosemary pine beard balm. Or, try out this juniper spiced beard balm, which smells just as wonderful and emphasizes the spicier aromas of cinnamon and cloves. For some lovely balms that don’t require a beard, make this pine and honey moisturizing lip balm, or use your favorite evergreen in this versatile conifer needle lip balm! If you are tired after a long day of work or cold from romping about in the snow, relax in a warm bath that smells like a walk in the woods. You can make these pine bath salts, perfect for stress relief, and keep a jar on hand for all bath-worthy occasions. Wanting to give your hair care routine a change? 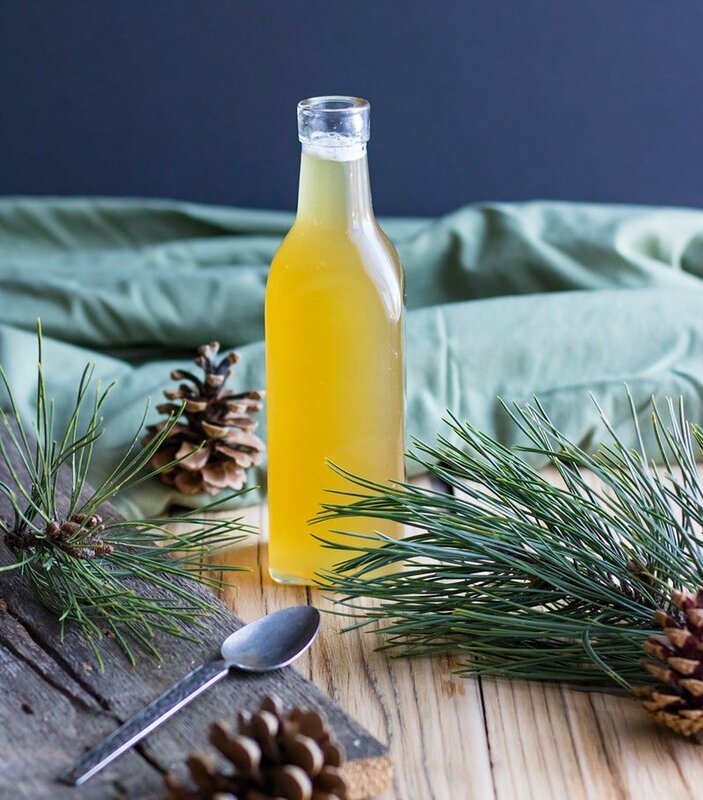 Give this pine needle infused vinegar hair rinse a try! Wow! I have always loved trees, but researching these recipes has made me appreciate them even more. I can’t wait to gather more conifer needles during my next walk in the park, and I hope I have inspired you to do the same. What are you going to make first? A batch of cookies, a seasoned salt, or that frothy eggnog? I think I see some infused vodka in my future. Cheers! Lucia Hadella is an environmental writer from Talent, Oregon. Her interests include human-environment interactions, climate change, and resilient futures. Lucia recently graduated from Oregon State University with a B.S. in Natural Resources and an M.A. in Environmental Arts & Humanities and moved to Columbus, OH this winter to begin her urban nature adventure! You can find more of her writings on her nature blog, True Nature Filter and on her Instagram account @true_nature_filter. Do you have paper copies of your books? Healing Herbal Infusions is the only book that has a paper copy, the other two are ebooks.